Every year the retail holiday season starts earlier than before. We are seeing big box retailers open their doors on Thanksgiving afternoon to hordes of people elbowing and clamoring for discounted big-ticket items. NeweggBusiness does not condone this madness—you belong with your family and friends on Thanksgiving, not at some store. We will never understand the allure of physically going to a crowded store on Thanksgiving Day (or any day, for that matter). But this doesn’t mean you should abstain from online shopping on Thanksgiving. On the contrary, you have every reason to shop on Turkey Day—both for gifts for your loved ones, and for your business as well. Here are five reasons you should shop online on Thanksgiving Day without qualms. A widely-published study by Adobe predicts online prices will bottom out on Thanksgiving Day, with an average item discount of 24 percent. You will see that in the graph below, the price trough is significant, and exclusive to Turkey Day. Price levels will rise steadily through the weekend, remaining low though Cyber Monday before rising a little and plateauing throughout the holidays. The idea of Cyber Monday is a relic from the technology stone age (circa 2005) before smart phones and high-speed wireless Internet. Back then, people had to wait to shop from their workplace T3 connection, which is why Monday became a huge online shopping day. Obviously that’s no longer the case. 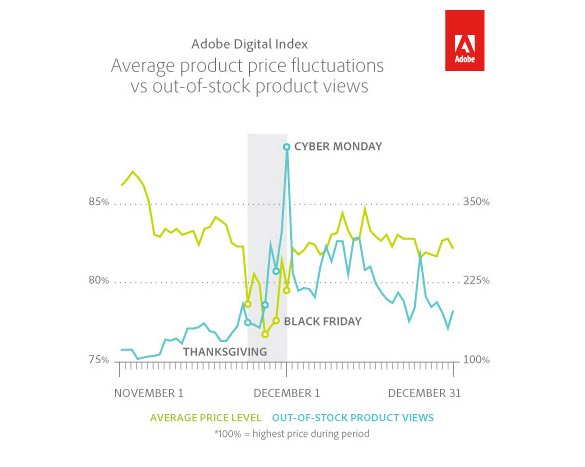 It is a no-brainer that Adobe predicts a dramatic spike in out-of-stock product views on Cyber Monday, because peak shopping levels will have been going on for five days beforehand. The people you’re with on Thanksgiving are probably the same ones you’ll be around for the other gift-giving holidays, whichever ones you celebrate. Wouldn’t it make sense that you’d start getting gift ideas on Thanksgiving? The logical next step is to pull out your mobile phone, access grandma’s Wi-Fi, and pull the trigger. And since you’re shopping anyway, why not scope out a few items for co-workers as well? While you’re at it, you can pick up a deeply-discounted PC for the office, too. I’m just saying they will be on sale and you’ll be shopping anyway. Just as plenty of folks are lamenting going out to Walmart on Thanksgiving (“retailers are ruining Thanksgiving!” writes the New York Post; “Christmas Creep is ruining the Holidays,” says the Chicago Tribune) there are those that decry shopping from your iPhone 6 as some kind of breach of etiquette. Our thinking is that if it is OK to snap a photograph of the turkey at the table, then there’s no harm in taking a few minutes to shop. If we can’t multi-task on the phone while watching Detroit drub Chicago, then we need to reassess our priorities. Thanksgiving won’t curb anyone’s addiction to Clash of Clans, so we say pull out your phone, shop, and save money. NeweggBusiness is running Thanksgiving Day low prices all month long. If rolling out holiday deals early is a crime, we are guilty as charged. Our Black November event offers deep discounts on hundreds of items, like laptops, desktops, tablets, hard disk drive and solid state drive memory and much, much more. There you have it—five solid reasons to shop on or before Thanksgiving. Try to remember the enormous Thanksgiving Deals that are out there when fighting off tryptophan-induced food coma on Thanksgiving Thursday. You have every reason to shop on Turkey Day—for your loved ones, and for your business. Five reasons you should shop on Thanksgiving Day without qualms.